Web browsing made it easy for the designer and homeowner to coordinate their visions for this color-filled Clayton residence. 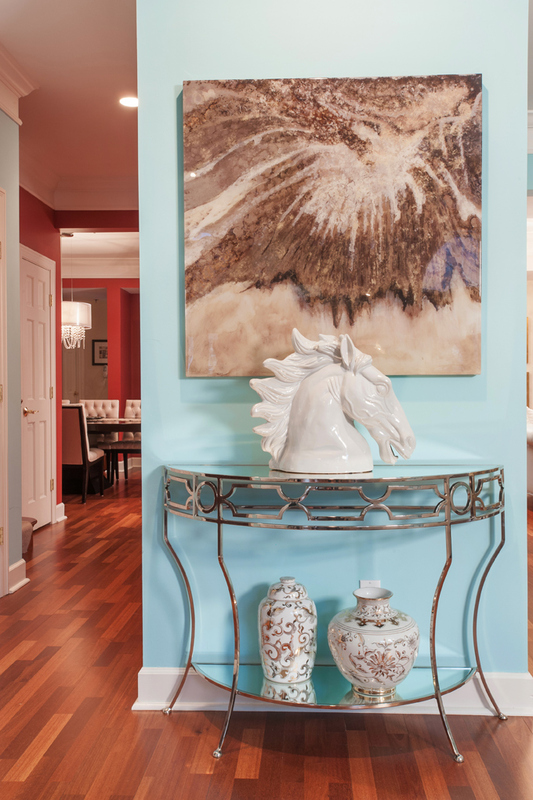 Oriental urns and a spirited ceramic horse head are displayed on a demilune table beneath a warm-toned acrylic "geode" painting with metallic flecks. Tiffany blue walls create a chic backdrop for the living room's "ribbon"-fronted entertainment center, leather seating, hexagonal coffee table and contemporary chandelier from Metro Lighting. Silvery hues with pops of lemon-yellow establish the palette for the living room conversation nook. 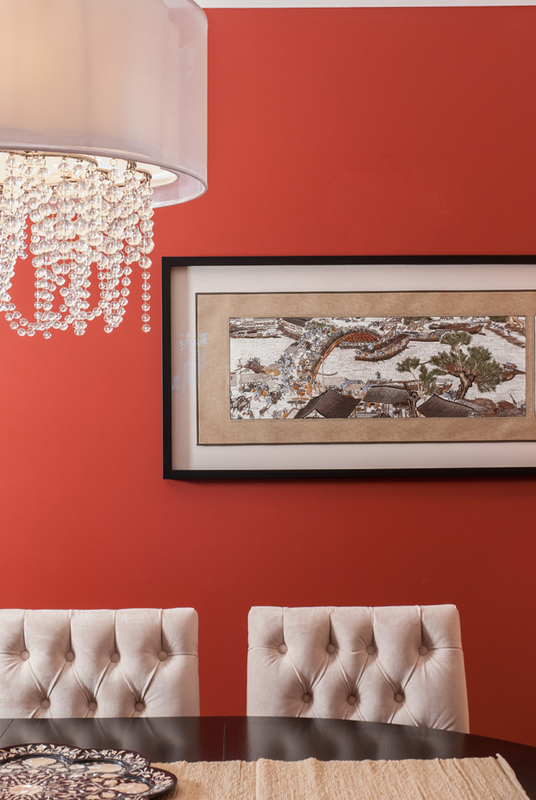 Brick-red walls provide dramatic contrast for the dining room's sleek espresso-stained furniture, decorative embroidered silk from Beijing and chandelier with translucent drum shade and glass beads. 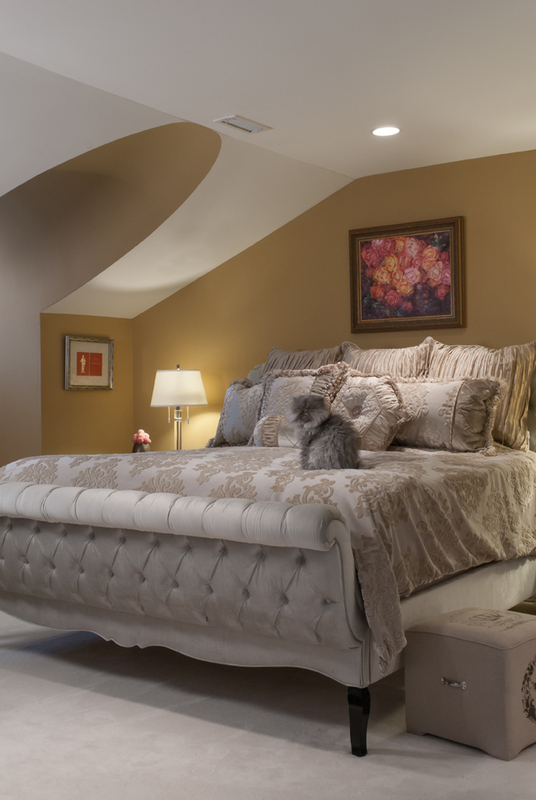 The master suite's tufted velvet sleigh bed is a favorite snuggery for Bonbon, the owners' Persian. A unique "keyhole" barrel vault tops the adjacent alcove and a floral painting from Madrid complements the bedroom's warm ochre walls. Tank, the Abdulraufs' English bulldog puppy, welcomes guests to the family room, with its dove-white microfiber sofa and oversized cocktail table from Restoration Hardware. A prized acquisition from India, this vivid Peacock Throne wall piece is hand-embroidered and set iwth semiprecious stones. Internet technology has virtually revolutionized the interior design industry over the past decade. In fact, a recent ASID (American Society of Interior Designers) study determined that more than 90 percent of designers use the Web regularly to research the latest trends, products and resources. Formerly from Manhattan, Anne Marie is a speech-language pathologist, currently working with toddlers. Husband Saleem is an internationally renowned neurosurgeon, chairman of the Department of Neurosurgery at Saint Louis University and developer of the lifesaving brain bypass technique named for him. The couple purchased their fashionable mid-rise in downtown Clayton two years ago, and it showcases their zest for color, treasures acquired during their worldwide travels and their vibrant cosmopolitan lifestyle. Brought together by their respective careers, the Abdulraufs are wonderfully warm and energetic. They entertain frequently – up to 80 guests at a time, and it was the need for more entertainment space that prompted their move to the 4,000-square-foot two-story. “And we both love the Clayton environment, particularly all the parks and restaurants,” Anne Marie adds. With its soaring ceilings, arched windows, elaborate woodwork and three balconies, the Abdulraufs’ newly acquired home required no structural changes, but the interior décor presented a “color issue.” “We’d already decided to purchase all-new furnishings, and we wanted something contemporary, glamorous, bright and fun – a home that reflects our tastes,” Anne Marie explains. A friend referred her to Kimberly, who instantly determined that the new décor would have to be “very current, as stylish as her clients.” First on the list was a fresh color for the living room walls, which were a conservative mushroom hue. 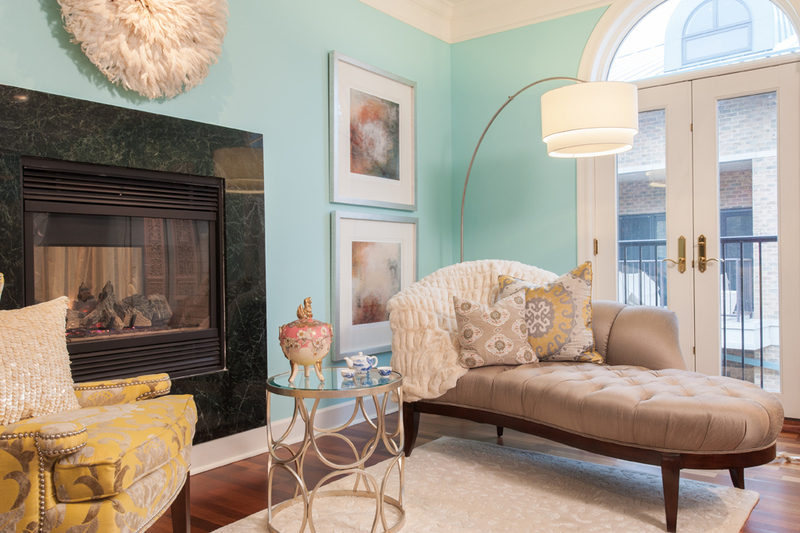 It was Saleem who suggested Tiffany blue, a choice that inspired the flair now evident throughout the home. Noting that she tries to “design through the eyes of guests, creating nooks that make people feel comfortable,” Kimberly separated the living room’s elongated dimensions into two seating areas. Boldly contemporary, the larger area is furnished with a bone leather sofa and settees, set on a Safavieh wool rug with a near-Tiffany blue background and ivory medallions. Suspended above the hexagonal chrome-and-glass coffee table, a massive, 4-foot chrome chandelier from Metro Lighting is the focal point for this space and, in Kimberly’s words, “makes the room feel more intimate and grounded.” Other key pieces include a mahogany/rosewood entertainment center and matching console with silver-leaf “ribbon” fronts from Horchow, and various occasional tables from Worlds Away in glass, chrome and silver leaf. The smaller area is arranged around the living room’s marble-tiled, see-through fireplace and features a chaise longue upholstered in a silvery taupe, nailhead-trimmed side chairs in lemon-yellow and silver-gray damask, a marble-topped coffee table and a Surya rug in a textured, tone-on-tone ivory animal print. Adding visual interest to this cozy conversation nook are an African feather headdress, centered above the fireplace, and a vivid Peacock Throne wall hanging from India, hand-embroidered and set with semiprecious stones. “Saleem and I convinced a jewelry store owner in Agra to sell it to us,” Anne Marie remembers, with a secretive smile. Color abounds in the adjacent library/sitting room as well, with its Surya wool rug in an over-scale contemporary paisley, Chesterfield loveseat in robin’s-egg blue leather from Horchow, and for a touch of pizzazz – a fauteuil chair in fuchsia velvet. The large oval coffee table is mahogany with a cream/ivory marble top, and newly added to this space is a hand-painted, Queen Anne-style chinoiserie secretary. In the dining room, rich brick-red walls provide a dramatic background for the espresso-stained mahogany pedestal table, sleek dining chairs in tufted oyster velvet and a classic buffet and china cabinet. 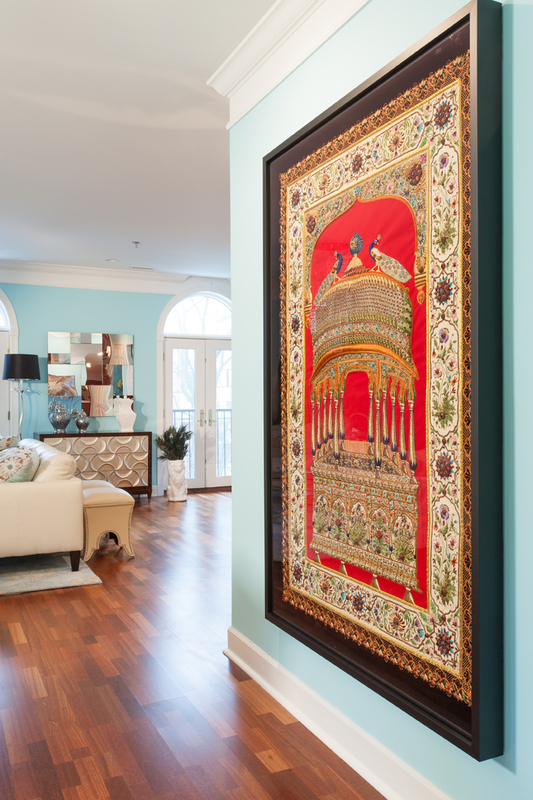 Mementos from the owners’ travels, accent pieces include a table runner from Bali; an ebony and mother-of-pearl centerpiece, crafted by artisans whose ancestors inlaid the Taj Mahal; a framed embroidered silk from Beijing, and a hand-painted tea service from Romania. Few changes were necessary in the island kitchen, which has mahogany cabinetry, deluxe appliances, a built-in china hutch and a fresh-air balcony the owners use for grilling. Carved, high-back bar stools were chosen for the island overhang, and a marble-topped bistro set creates the perfect spot for quick snacks or morning coffee. 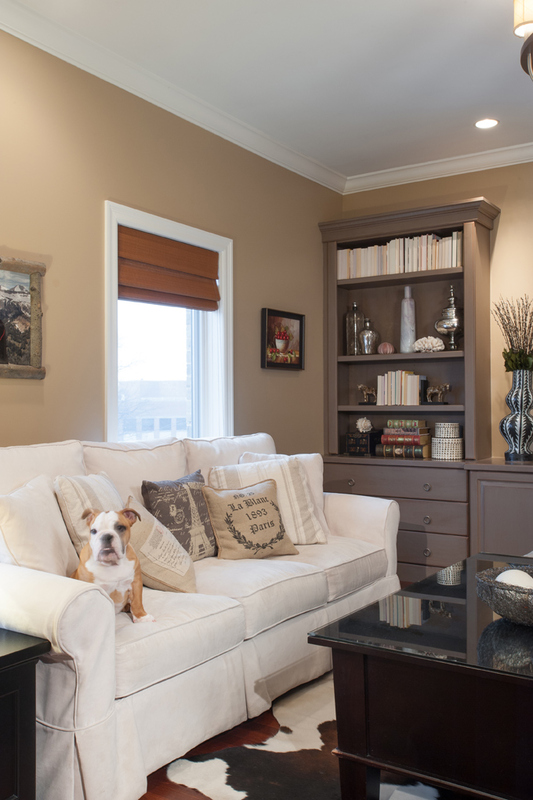 Tank, the couple’s English bulldog puppy, excitedly welcomes visitors to the family room. Open to the kitchen, this haven is comfortably furnished with a dove-white microfiber sofa, an oversized coffee table from Restoration Hardware and linen-covered side chairs that swivel for TV viewing. Moving to the upper level, the staircase landing is dominated by an immense mirror with octagonal facets, and warm ochre walls establish a tranquil ambience for the spacious master bedroom, which accesses a beautiful balcony. Upholstered in tufted platinum velvet, the sleigh bed is enhanced by a medallion-motif damask comforter and decorative pillows in complementary tones. An antiqued mirror nightstand serves as a side table between transitional-styled recliner chairs in textured champagne cotton, and contrast is provided by an espresso-finished highboy and dresser, topped by a baroque-shaped mirror. Somewhat more traditional, the guest bedroom displays a Caribbean-inspired wrought-iron bedframe, a classic Ralph Lauren spread in a coral print and a 70-year-old inlaid cedar chest that belonged to Anne Marie’s grandmother. Tucked into the room’s architectural alcove is an additional twin bed, topped with two floral quilts, one from Sundance, the other handmade by a relative. Doubling as Anne Marie’s office and extra guest space, the barrel-vaulted loft has two intriguing structural elements – a huge demilune window offering a fabulous view of downtown Clayton and a ledge sizable enough to accommodate a futon with chocolate bedding and kiwi-colored pillows for a splash of color. It’s been said that “color is the purest form of expression.” And although Internet technology has significantly broadened the scope and dimension of the interior design field, this ultra-chic residence proves that it still takes the skill of a designer like Kimberly to capture and express the owners’ unique character.